Wandering around a city can take you on an unexpected adventure! 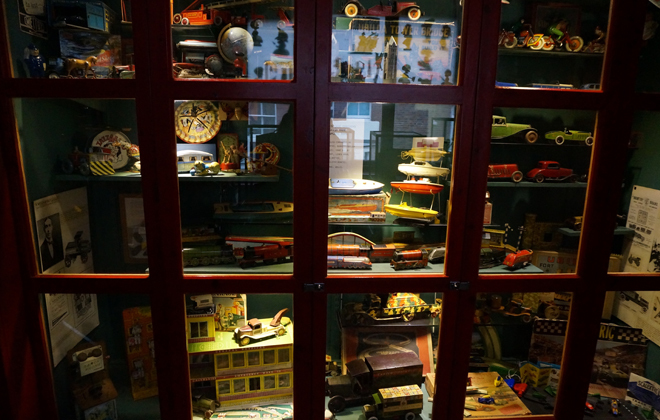 Sometimes when you are least expecting it, you stumble upon the most magical and strange gems, which is exactly how I happened upon Pollock’s Toy Museum in London. Intrigued by the storefront with its giant jester pinned up to the second story, I decided to take a look inside. 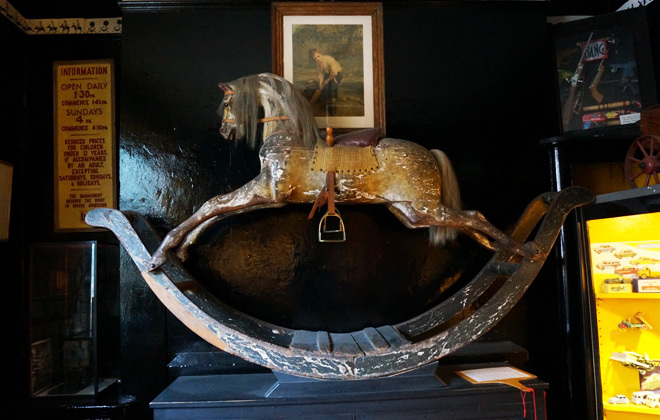 I entered to be greeted by a friendly faced gentleman sitting next to an ancient looking register, as he handed me a printed guide to the toy museum, which consists of rooms upon rooms of collections of everything from puppet theaters, to rocking-horses, to doll houses, to old Punch and Judy toys. I was amazed and truth be told, slightly spooked by the amount of delicately preserved antique toys that were all gathered under this one roof. Inside it’s all a bit dark and dusty, with entire rooms devoted to just baby dolls set up in amphitheater style seating, or teddy bears in terrariums. A series of rambling rooms accessed through dark staircases with old lace curtains in the windows. Dim lighting, creaky floorboards, the works. You couldn’t have set designed it better. The best way I can explain it: creepy, weird, cool. 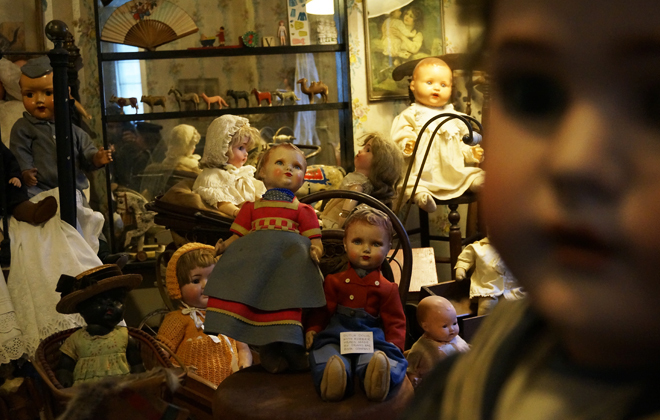 Basically, my worst nightmare come to life; to be trapped in a room with 20-30 really old baby dolls. Just a tad bizarre yet fascinating, isn’t it? A bit creepy, too? 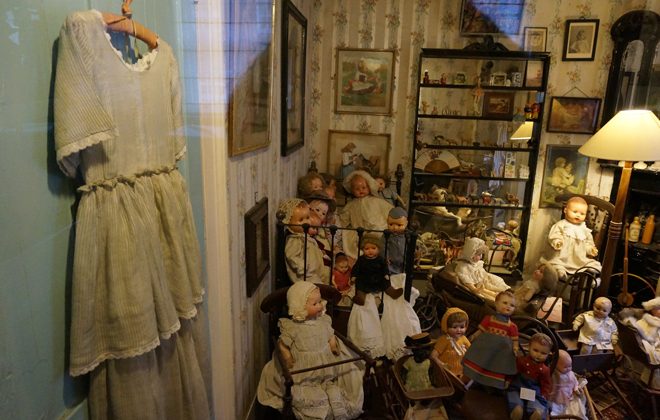 A few too many dolls all displayed behind glass in one “room”! 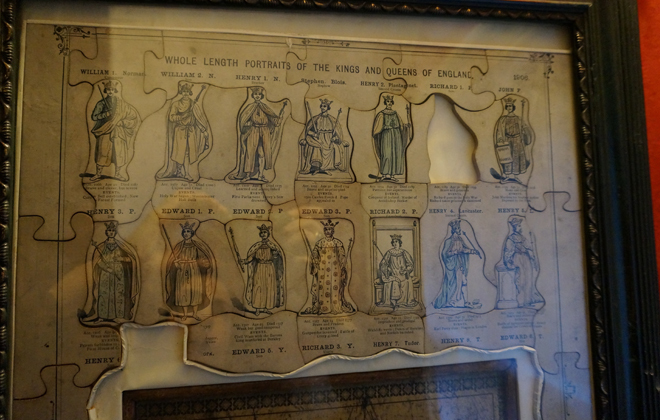 An old puzzle depicting the kings and queens of England. 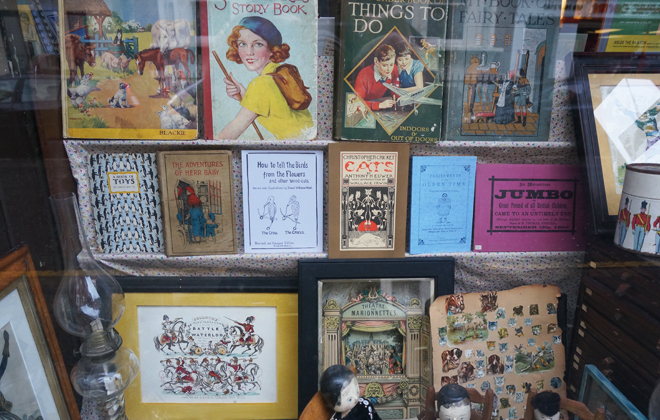 Some amazing old book covers in the window out front. 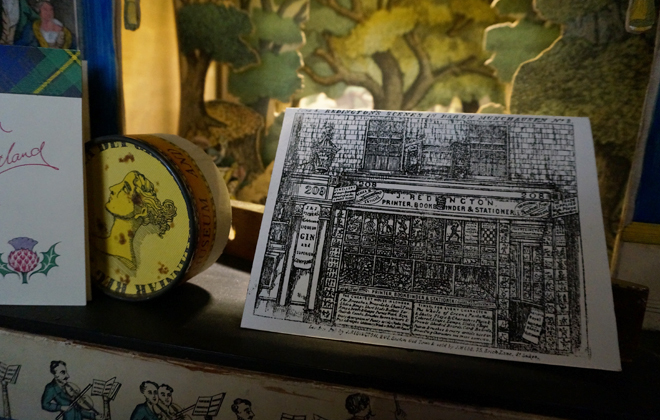 The store originally opened in the 1850s, where owner Benjamin Pollock sold toys and ran a print shop, creating beautiful paper puppet theaters. 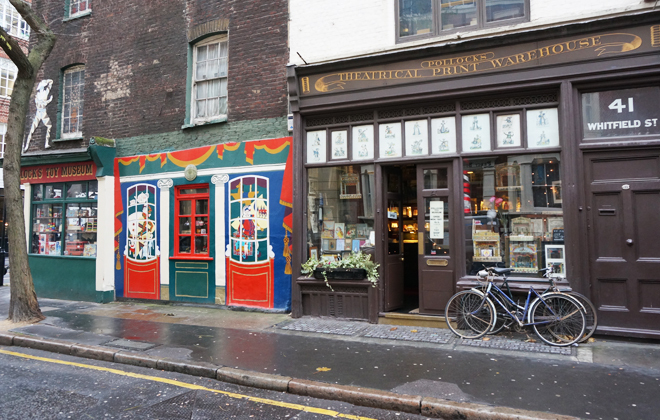 In the 1950s the store was moved to its current home in the London neighborhood of Fitzrovia, where it has remained opened as a museum for Victorian era toys, keeping the print tradition alive with the adjacent print shop. They also opened Pollock’s Toy Shop in Covent Garden which is now a cult classic of a toy destination. There you can buy updated and slightly more “child-friendly” versions of the amazing Victorian toys preserved and on display at the museum. Room after room, case after case of toys…. 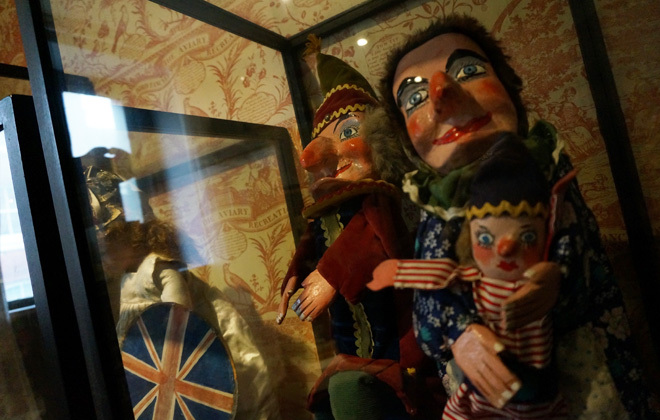 One of the many (also kinda spooky) Punch and Judy dolls. When I finished my tour, I returned to the main floor and was again greeted by the man behind the register. He was shy and quiet, but asked me what I thought of the museum. We struck up a bit of a conversation, and it turns out that he was Eddy Fawdry, the grandson of founder Benjamin Pollock. He told me more about the history of his family, and the amazing paper theaters, which really are kind of the crown jewels of this collection. As we talked he became more animated, telling me how the paper theaters used to be printed right next door by his grandfather. Now these masterpieces can be found at the Covent Garden Toy Shop, or at the famous Liberty Department store. Eddy Fawdry, the lovely grandson of founder Benjamin Pollock, surrounded by the theatres. 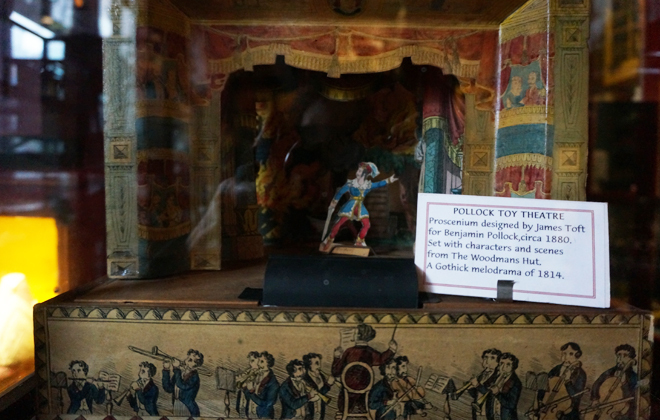 Pollock toy theaters on display at the finish of your tour. Some more of the print examples on display. 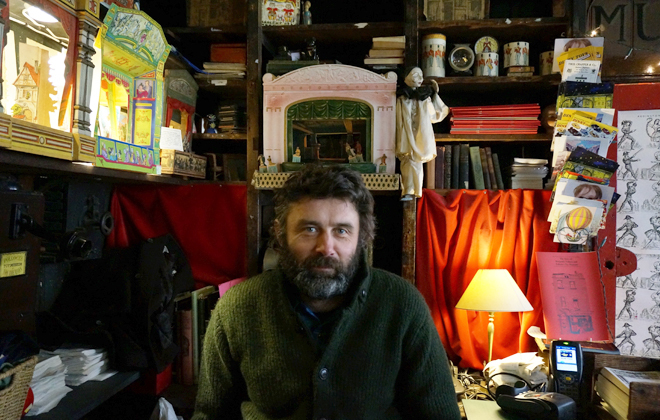 It truly is a unique experience, each room more filled to the brim than the last with the most beautiful and strange old playthings, games and dolls in abundance. It was so interesting to think about how all of these bizarre objects were actually what children had to play with centuries ago! They definitely do make for fascinating displays now. When else have you had the chance to be in a room filled wall to wall with Punch and Judy? Given the time of the year and the fact that if you have children in your life you are likely looking for presents for them, I thought it would be fun to post about this toy museum and store. It’s such an anomaly in the world of toy shops like Toys “R” Us and FAO Schwartz. How surprising would it be to unwrap a theater like the ones from Pollack? Almost as surprising as the Toy Museum itself!